Happy Birthday Office 365, what’s next? It sure looks like it’s been around for a lot longer, but office 365 is officially celebrating its 1 year anniversary this week. It’s true that some aspects of earlier MS cloud effort have been around for 4-5 years under different names like BPOS but the new branding and consumer side were introduced last year and SharePoint online took a huge step forward. So how is it doing? Not bad according to different reports. 3.5 million Consumers have signed up and 15% of exchange users are in the cloud (6% increase over the last year). Microsoft is clearly betting the farm on cloud and the recent choice of its cloud chief Nadella to be the next CEO is a telling sign. A recent technical summary at ZDNet and a financial analysis at Seeking Alpha both look very positively on the stability and profitability of this model. Reduced IT costs: No need to allocate server or VM’s. No need for redundancy and backups. No need for regular installation of patches and updates and all the testing involved. We invested in putting provisioning processes in place that dramatically reduced the timeframe for creating new sites and reduced administrative effort. Mobile and iPad access through Office Web Apps. Social: the new newsfeed, Yammer integration and Communities bring out of the box enhanced collaboration and social interaction. Stronger security and privacy commitments. Not that the NSA would have a problem getting to most information anyway but knowing that all corporate secrets are basically available to them upon request is disquieting. Multinationals may not be willing or legally able to make the jump and trust Microsoft with their data. This can be the biggest obstacle for mass adoption for larger companies. Small to midsize companies may care less. More control. From an IT point of view this is scary. An inhouse server you can test, tweak, add memory to, reboot when needed, and install 3rd party add-ons. You now, control. Giving away the ability to jump in and intervene is hard. Even when Microsoft does deliver reliability and reasonable performance our natural impulse is to try and make it better, tweak, optimize. Not much you can do here. I do hope that Microsoft expands the controls given to customers. It will get a lot of untrusting IT guys a level of comfort that is not there now. Support for Web Content Management. If we are giving up a local SharePoint environment, why force users to have one if they want to take full advantage of SharePoint as a content management tool for public website? Add native migration tools. Not that I have anything against our partners the migration tool makers but releasing a platform with no out of the box method of upgrading to it was very odd and the fact no support has been offered since is disappointing. 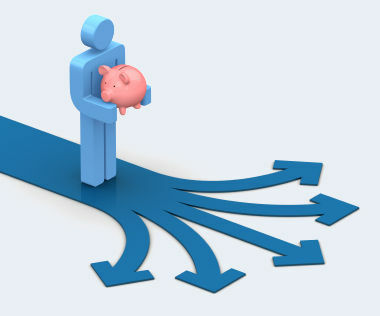 Makes the natural audience of smaller to mid-size businesses with an additional expense to migrate. Cleaner social toolset. I wrote about it earlier in the year, that the Yammer acquisition created some confusion among users. The promised SSO is still outstanding and the small incremental steps like the one released this week are a little confusing. The new SharePoint 2013 was just reached “Release To Manufacturing” stage! It is available for download now to MSDN subscribers and slated to be officially released in Q1 2013. To celebrate, we thought to share some of the highlights in this upcoming release. While SP13 builds nicely on the foundation of previous versions, it does offer plenty of cool new features / improvements for business users to get excited about. So here are the top 10 in no specific order. Cloud First: while SharePoint was part of Office 365 for some time now, it was a limited experience. SP13 is promising the full experience in the cloud + regular release of improvements and enhancements. Cross site publishing allows for the first time to share content across sites, site collections, applications and even farms. We built a custom solution for this for an insurance company that wanted to post new forms to the public site, Agent portal and Intranet in a single action. Now it is built in. For more…. SharePoint Apps! : one of the major changes to SP13 is the concept of apps. Apps are just like they sound, web applications that can be packaged so users can add them to pages or use them from within SharePoint. Not that different from the concept of solution packs before (line the Famous Fab 40 that were discontinued in SP10..) of packaging your web app in a web part. The new model does have a few advantages. It gives users more control on apps to use and while IT can still approve apps, they do not need to install them for users. It can also make internal applications easier to find and reduce redundancy. For more on apps see the Microsoft SharePoint apps blog. Simple project / task management: for complex project management you still have project server but it is an overkill for most simple projects. The new team site template includes the ability to manage tasks, deadlines and a simple work breakdown structure for a project team. It generates a personal and a group view of tasks and timelines perfect for keeping everyone on time. For more.,.. New Usage Analytics and useful views: Microsoft is replacing the SharePoint analytics with 2 new tools: search analytics and usage analytics. Usage analytics provide more detailed view of how SharePoint is used and even better, adds up to 12 cutom events to be added and tracked without custom tagging. You can also use the data collected from these tools for useful views such as Most Popular, Popular Searches ect. For more ..
Before Migrating to SharePoint 2010 or Implementing SharePoint for the first time – do a business case! Even if you’re sure you want to implement SharePoint for the first time or migrate to SharePoint 2010, it’s a good idea to do a business case. Why? Not just because it’s good form. Unfortunately, organizations that skip this step risk taking steps in the wrong direction instead of rectifying identified problems with elegant solutions. SharePoint 2010 is a great product, with many new features including seamless integration with Office, major improvements to Search, and great collaboration features. So, why is it a good idea to do a business case even when you’re already clear that you want to migrate to SharePoint 2010 or implement SharePoint for the first time? The act of creating the business case begins to make the successes and impacts of the project a reality. In the case of SharePoint 2010, one of the first important tasks is to really articulate what SharePoint will be FOR YOU and your organization. SharePoint is multifaceted. The more focused an organization can be on what it needs out of SharePoint, the more likely its implementation will be successful. Writing a business case means thinking about the questions of why are we doing this? What are the costs, timescale, benefits, and risks? Having thought through these questions and their answers, even best guesses at ROI and benefits, and presenting them in a well formed document provides you with something to share and enables you to involve other people. Such a document is a good means of getting buy-in and socializing the changes you want to see, as early in the planning stages. Even when change will bring a positive outcome, it’s never easy to get everyone on the same page for a smooth transition. SharePoint can never be rolled out by one individual – as a system it will need at least cooperation from just about everyone in an organization, and starting with a clear understanding of why the change is happening and what the benefits are provides a solid foundation for success. Getting specific on the tensions solved by migrating to or implementing SharePoint 2010 not only allows your organization to do the right thing for its growth, but also to have the means to look back and assess success. If, like many organizations do, you plan on hiring a vendor to do the implementation or migration, you will want this information prepared to communicate your needs to the vendor. You’ll be better able to evaluate the vendor’s proposals and solutions if you’ve thought your needs and concerns through. Edgewater does many SharePoint implementation and migration projects and no two are ever the same. It’s important that you use SharePoint to build solutions to the problems specific to your business. Don’t just skim the surface and fit your needs to a list of features that you know of or that already exist. This will lead to poor adoption and waste of your resources. The better you understand your actual needs, the better your solution can be. Another important facet of the business case for SharePoint is that it encourages you to focus on ROI – it’s important for companies to really understand the long term costs of a SharePoint implementation. When implemented correctly, SharePoint 2010 can save your business considerable costs and streamline your processes. In addition, training is critical to making any conversion a success. Sitting down to write or review a business case can be the first step in really thinking through what it means to make a successful change, how best to do it, and what it means in terms of specific costs and specific benefits to the organization. A good business case can help your company focus on allocating the right resources, know what to expect, and be clear on what constitutes a successful project completion. If your business case is convincing at a certain price point, and all your RFP responses come in higher than that, you’ll readily know if the project is really worth pursuing, or what portion of it to focus on first if you’ve written a good business case. As author J. Peter Bruzzese puts it, “SharePoint 2010 is jam-packed with new features that matter, ones that will increase productivity if used properly. I predict the number of companies using SharePoint is going to soar with this next release. I’ve been working with SharePoint since its first release (where I hated it) through 2007 (where it was growing on me) on to 2010 (where I can honestly say I’m really impressed by and loving it).” (Source) There are many resources available through searching online to assist with creating a business case for SharePoint 2010, but only someone with real knowledge of YOUR organization can write the business case for you, and ensure you’re using SharePoint 2010 properly to serve your business’s needs. Workflow and BPM often get lumped together but it is important to understand the difference between them if you are to pick the right tool for your enterprise. While it is generally agreed that workflow is for modeling simple sequential processes and BPM solutions are more capable of handling complex tasks the distinction between the two needs to be further sharpened. According to David McCoy of Gartner BPM can be defined as “… a structured approach employing methods, policies, metrics, management practices and software tools to manage and continuously optimize an organization’s activities and processes.” Workflow on the other hand is concerned with tasks and application-specific sequencing of activities through a series of predefined steps, involving a small group of people and/or closely related applications. The distinction between the two is far from crisp and in fact it can be argued that both are part of the same continuum. However, there is a distinct difference in focus and complexity between the two. Here is a chart that attempts to further define the two based on capabilities and task suitability. A ccording to a recent survey by Forrester, Microsoft and SharePoint came in as #1 among the IT decision makers for use as BPM platform followed by Oracle, SAP, IBM, and a host of other BPM centric companies. Forrester report further notes that despite Microsoft’s best efforts to not position SharePoint as a BPM solution (rather as a collaborative workflow solution); the message does not seem to come across clearly. 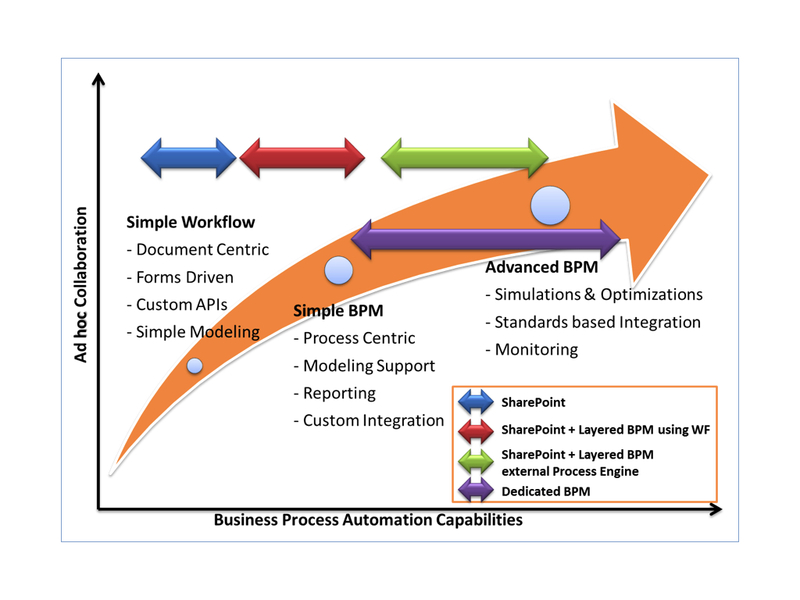 This confusion seems to thrive due to lack of clear and well-defined goals for business process automation and understanding of capabilities of SharePoint and BPM suites (BPMS). 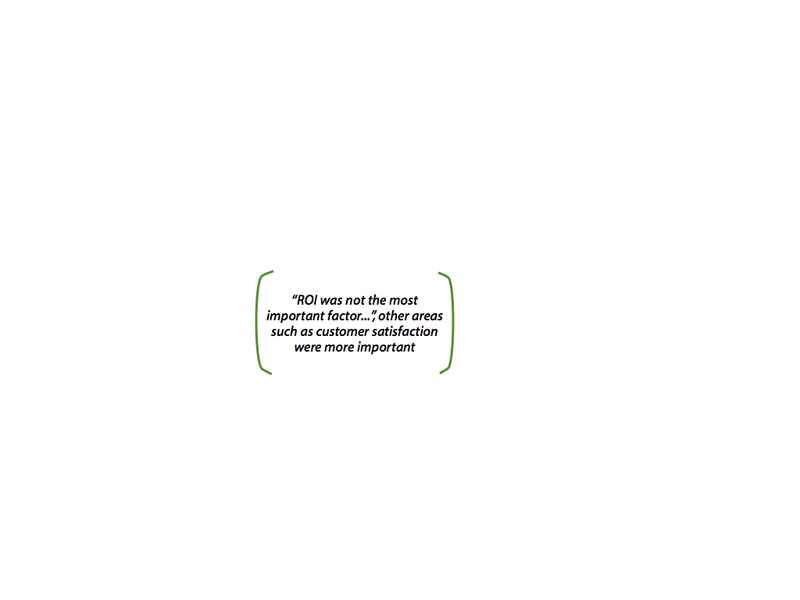 The Forrester report outlines that SharePoint’s features for supporting true BPM are limited. Most of SharePoint’s capabilities in this arena are founded on Windows workflow foundation (WF). 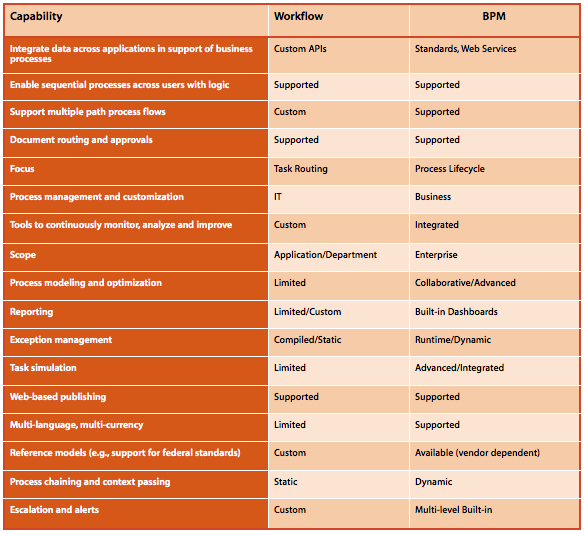 While a custom solution can be developed based on SharePoint and WF API to support BPM like capabilities, such an endeavor is bound to be expensive and brittle. SharePoint shines best when OTB capabilities are leveraged to the maximum and customizations are managed carefully. SharePoint’s workflow, document management and collaboration features can be used to develop robust workflow applications that can simplify and automate document & form centric business processes. SharePoint can also serve as a hub of cross-department and cross-application integration but only at the user interface level. SharePoint does not pretend to act as middleware or an enterprise service bus (ESB) and therefore does not provide any standards based application integration features – tasks best left to dedicated integration platforms or BPM solutions. While SharePoint is not ideal for complex business process automation it can certainly be used to get started. If all you organization needs is automation of simple and commonly used business tasks (approvals, document management, simple HR applications, financial approvals, etc.) that do not require tight integration with other data systems and do not require complex exception processing, modeling, optimization, monitoring, etc., then it is a good candidate for SharePoint workflow. However, if your organization is truly looking into business process automation and business process improvement (BPI) then there are many 3rd party solutions (AgilePoint, Global360, K2, Nintex etc.) that can be layered on top of SharePoint to create a more robust solution. The advantage of a layered solution is that 3rd party vendors are able to leverage Microsoft’s significant investment in ease of use, collaboration and user interface integration capabilities of SharePoint while adding core BPM functionality. Such solutions are also typically less expensive and deploy more quickly than a traditional full-blown BPM solution (depending on the situation). There two basic flavors of the layered BPM solutions (products that leverage SharePoint’s platform & interface for most interactions). The first flavor of these solutions relies on the underlying WF as their workflow engine. Using WF as the base they have built capabilities that are more advanced than out of the box capabilities of SharePoint. Furthermore they are able to maintain a light footprint by leveraging SharePoint and WF infrastructure. However, they naturally suffer from some of the same shortcomings as WF. The second group of solutions relies on proprietary workflow engines that are not built on top of WF. Such solutions typically have larger footprints since they create their own parallel infrastructure for workflow processing and data storage. Their independent foundation allows them to provide capabilities that are not limited by WF but typically at the cost of additional infrastructure complexity. There is a place for either kind of solution and picking the right tool (SharePoint workflow vs. SP layered BPM vs. dedicated BPM) is a vital cog in any business process automation or improvement endeavor. However, the story does not end at picking the right tool; in fact it is just getting started. 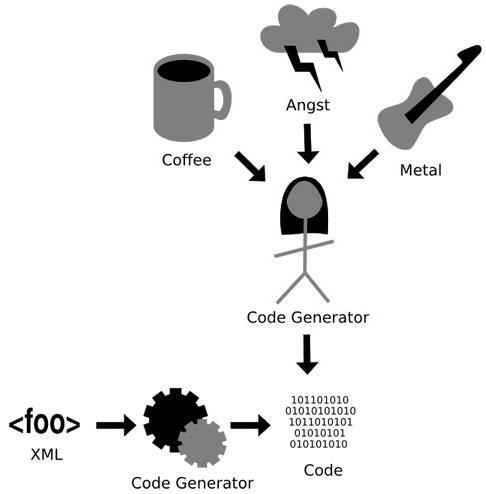 Edgewater recently conducted a case study on the effectiveness of such efforts and found that there is a significant disconnect between popular BPM messaging and the companies deploying such technologies. While ROI is considered to be the holy grail of most IT projects the respondents in the survey noted that “ROI was not the most important factor … “, other areas such as customer satisfaction were more important. Survey also found that while BPM tools are more than capable of modeling complex processes organizations implementing BPM preferred to “start with well-defined process that involved fewer people to get a quick win and buy-in first”. 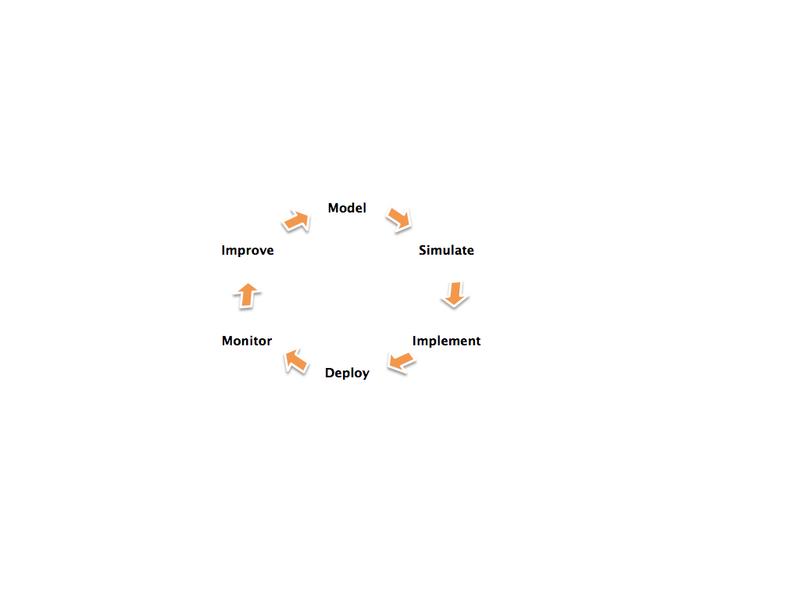 Perhaps the most important finding was that the success or failure or an implementation depends on “solid understanding of the business AND the necessary technical skills to implement BPM; just one won’t work.” Business Process Improvement (BPI) needs to be a continuous learning and optimizing cycle. Picking the right tool is only half the battle, having a clear vision of goals and objectives and how BPM may or may not help achieve those is just as essential.